De'Veon Smith falls into the end zone for Michigan's only touchdown. The running back's score gave the Wolverines a lead they would not relinquish in an eventual 10-9 victory. The Wildcats (3-6, 2-4) fell to Michigan (5-5, 3-3) 10-9 on Saturday, with an avalanche of ineptitude keeping NU out of the end zone until three seconds remained in the game and a late rally falling short when senior quarterback Trevor Siemian slipped to the Ryan Field turf on a two-point conversion attempt to win the game. The Cats checked nearly every box on the list of possible mistakes; with poor coaching and bad offensive execution resulting in a late deficit they fell three yards short of overcoming. NU turned in a much better overall performance than last week’s 48-7 drubbing at the hands of Iowa, but the Cats’ inability to convert Michigan’s miscues into points cost them dearly. After a muffed punt by senior receiver Tony Jones gave Michigan a short field, the Wolverines finally cracked a scoreless deadlock in the third quarter, with De’Veon Smith carrying in from 3 yards out to give them an ultimately-insurmountable seven-point lead. Siemian looked sharper than he had for most of the season, completing 32 of 49 passes for 273 yards and a late touchdown, but two first-half interceptions kept the game scoreless into the third quarter. Redshirt freshman Matt Alviti spelled Siemian for several plays in the first half, carrying three times for minus-two yards and taking a sack on what would have been his only pass attempt. Freshman running back Justin Jackson was unable to provide the spark he did earlier in the season, carrying 17 times for just 35 yards. NU’s offensive struggles crested later in the third quarter. After a 79-yard interception return by senior safety Ibraheim Campbell, who played well in his return from a hamstring injury, NU started its drive on the Michigan 15-yard line. The Cats proceeded to lose five yards on a reverse, two on a sack and 21 on an intentional grounding penalty before punting. The offense sped up in the fourth-quarter, driving 95 and 74 yards as Siemian finally got into a rhythm. After giving up 48 points in their worst performance of the season last week, the Cats’ defense responded in a big way Saturday, keeping NU in the game despite the offense repeatedly shooting itself in the foot. NU held Michigan to 256 total yards, with two interceptions in the red zone keeping the game from getting out of hand and setting the stage for the late dramatics. After a 22-yard fourth-quarter field goal from junior Jack Mitchell was answered by a Michigan field goal, Siemian took over with 3:10 left and drove the Cats for a would-be tying touchdown, hitting Jones from three yards out with three seconds left. Instead, Fitzgerald opted to leave his offense on the field for a two-point conversion attempt. Siemian rolled right and, with a defender closing in, attempted to reverse his field and tumbled to the turf. 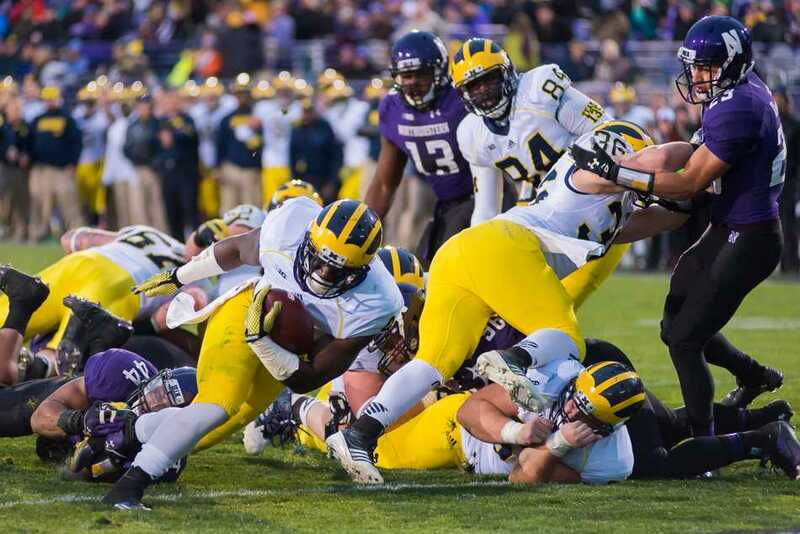 It was another heartbreaker for NU against Michigan, which knocked off the Cats in overtime in 2012 and 2013. This time, Fitzgerald turned down a shot at an extra period to attempt to win in regulation and had to watch as NU’s shot at a season-turning win slipped away. With its sixth loss of the season and fourth in a row, NU must now win out to reach bowl eligibility, a tough task with a trip to South Bend, Indiana, to face Notre Dame awaiting next Saturday.